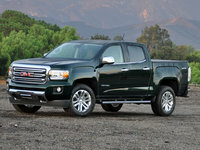 2016 GMC Canyon How our users rated the 2016 GMC Canyon. 2016 Chevrolet Colorado How our users rated the 2016 Chevrolet Colorado. 2016 Toyota Tacoma How our users rated the 2016 Toyota Tacoma. 2016 Nissan Frontier How our users rated the 2016 Nissan Frontier.